Melt shortening in a large pot over a low heat. Cool a bit, then add sugar, molasses and egg. Mix well (it won’t completely mix together). Stir in spices, then add the flour and mix thoroughly. Chill in fridge until completely cold. Form 1 inch balls, roll in white sugar, and bake at 350/175/gas mark 4 for 8-10 minutes. Cool & store in an air-tight container for maximum snappiness. Makes about 6 dozen cookies. It’s actually very important to cool the dough completely. I spread it on a cookie sheet and put it in the fridge, which makes it take not too long. It’s also very important, if you want cookies that actually snap, to make the dough balls no more than 1″ in size. Bigger than that and they won’t snap. Dunno why, they just don’t. And you can make these with butter and they’ll be gorgeously delicious but not snappy. I'm going to have to try these! This is a Martha Stewart recipe, but don't let that put you off! * I generally add a little more than this because I lurv me some ginger. ** Some people add less molasses, but I'm fine with the recipe as-is. I think it's a personal preference thing. 1. Line two baking sheets with parchment. Chop chocolate into 1/4-inch chunks; set aside. In a medium bowl, sift together flour, ground ginger, cinnamon, cloves, nutmeg, and cocoa. 2. In the bowl of an electric mixer, fitted with the paddle attachment, beat butter and grated ginger until whitened, about 4 minutes. Add brown sugar; beat until combined. Add molasses; beat until combined. 3. In a small bowl, dissolve baking soda in 1 1/2 teaspoons boiling water. Beat half of flour mixture into butter mixture. Beat in baking-soda mixture, then remaining half of flour mixture. Mix in chocolate; turn out onto a piece of plastic wrap. Pat dough out to about 1 inch thick; seal with wrap; refrigerate until firm, 2 hours or more. 4. Heat oven to 325 degrees. Roll dough into 1 1/2- inch balls; place 2 inches apart on baking sheets. Refrigerate 20 minutes. Roll in granulated sugar. Bake until the surfaces crack slightly, 10 to 12 minutes. Let cool 5 minutes; transfer to a wire rack to cool completely. Wouldn't these be called Kitsnaps: Ginger? 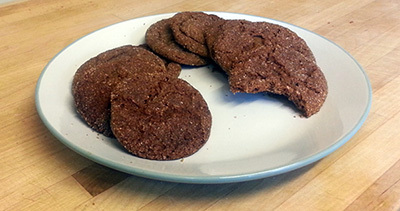 I so very much approve of a ginger snap recipe that delves into their snappiness. Possibly a weird question, but... When translating this into Australian, are those molasses molasses, golden syrup, or treacle?